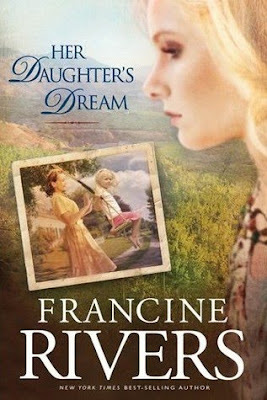 I just finished reading Her Daughter's Dream , by Francine Rivers, which as I am sure you are well aware, is the sequel to Her Mother's Hope (linked to my review - not Lisa's.) ;) Before I wrote this up I had to go read my review and refresh my thoughts and impressions on Book One. I've been wanting to read this sequel since it first came out but just got around to doing so. A friend of mine loaned me the book and I was determined to finish it before baby makes (made?) her appearance. Mission accomplished! I will say, however, that this is not really a book you want to read when you are pregnant with a baby girl. I had a bit of bad timing whereas this book is concerned. Following on the tails of Her Mother's Hope, we follow the story of Hildemara, Marta's daughter. Hildemara is struggling to survive tuberculosis. She is unable to care for her own daughter and so Marta comes to live with Hildemara's family and wins the affections and attentions of her granddaughter, Hildemara's daughter, Carolyn. (Are you following?) Hildemara grows bitter over the fact that her mother is able to spend more time with her children and her family than she is. Because Carolyn was just a wee thing when her mother had tuberculosis, she was unable to be near her mother and is unable to understand why her mother doesn't want her nearby. Instead, she bonded with her grandmother (Marta) and Hildemara is insanely jealous of their connection. Carolyn grows up thinking that her own mother doesn't love her as much as her grandmother does. She doesn't understand that her mother cannot be around her because of the disease and fear that she will pass it along to her children. A shy and quiet child by nature, Carolyn longs for affection and attention and unfortunately finds a false love at the hands of a dirty old man next door. As a result of the secret abuse she suffers, she separates herself even further from her parents, believing them to be inattentive and uncaring. This lands her in a heap o' trouble, and she ends up making a great many mistakes as she is growing up. Eventually Carolyn becomes a mother herself and gives birth to a daughter, May Flower Dawn. The book then shifts gears again. First we spend time with Hildemara, then Carolyn, and lastly (May Flower) Dawn. The sins of the mother's continue to be passed down, with unspoken words and lack of affection being the rule instead of the exception. Each female has issues with her mother. Each daughter suffers insecurities, pain and distress as a result of not feeling affirmed by the woman she most wants to be in good fellowship with. In short, this book was absolutely depressing. Seriously, if this was my first Francine Rivers book - I probably would not have read another. After reading this book, I went and read Barbara H.'s thoughts on it which I had briefly skimmed when she first published her take on it. Barbara liked the book and found it to be a "wonderfully written epic story." On that point I absolutely agree. It IS well-written. It is epic. It equally draws you in and repulses you in a single breath. Honestly, I didn't want to finish reading it. It was definitely an intense look at the darker side of human relationships and was chalk full of pain, agony and hardship. At the same time, Rivers did such a fantastic job of setting the stage in Her Mother's Hope that I couldn't fathom not knowing the conclusion of these women's individual (and collective) stories. There is a lot not to like in Her Daughter's Dream . Carolyn comes of age and is very experimental (in every way imaginable) during the 1960's. Think Woodstock, Free Love and the Vietnam War. It made my stomach turn. Dawn grows up as a teen in the 1980's who falls in love in high school and is subject to the pressures of teen romance. As Barbara points out in her review, all three women highlighted in this story are wrapped up in themselves and distrust one another and God's plan for their lives. It is a harsh, harsh story. It is a brilliantly told harsh story. I didn't like the subject matters because they made me feel uncomfortable. I didn't like how easily each woman seemed to fall into the trap of self-pity and bitterness. Yet those feelings are reality for so many. I know a great many people like stories which are not so neatly wrapped up. If you are one of those, you will have no qualms whatsoever with this book and will no doubt like it very much. I like my stories a bit cleaner in nature, I do have to confess it. I wouldn't perhaps mind so much the messiness of it all in another season of life, but with each woman's pregnancy and relationship with their daughter, I couldn't help but be disturbed - especially considering that I am expecting to birth a daughter of my own. It was a depressing book to read at the tail end of pregnancy when you really just don't want to be bothered so much with angst and just want to be relaxed and entertained. I was not relaxed. I was an engaged reader, to be sure, but not a relaxed one. I can't not recommend it but if I were to suggest a Francine Rivers book to someone who had never read her stories before, I would not start with this series! I guess that is the only conclusion I can come to, at the present moment, for this particular read. I checked this one out of the library and couldn't finish. Couldn't even really start it, actually. I've realized I'm not really a fan of the epic novel. Disappointing really, because I do like Francine Rivers. However,I was amazed...and disturbed at the how harsh and bitter these mothers could be. The cycle was awful. I had to finish it, but like you, I didn't necessarily want to. I was also disturbed that the sexual abuse was in BOTH books. So what makes an epic novel and epic novel? I think I've officially decided not to read this series. I've had it on my want list, but it really doesn't sound like my kind of book. I think lots of us did reviews on this book. I agree with you in that it was hard to read at times and some of the interactions made me mad. But it was a story of how generational stuff is passed on, which like you said is reality for some people and I found it redeemed itself in the end. I don't mind stories that are hard if there is some kind of redemption in the conclusion and I thought this one did that. I don't know, I sort of took it as a story that presents a wake up call to those who might be facing some of these issues in their family not to let it get to the point that the family in the story did. But definitely an emotionally tough read. The redemption at the end redeemed it from being totally dark to me. Otherwise it would have been just a depressing warning on what not to do in relationships. The dark side of this one was hard to take, but unfortunately so many people do experience these kinds of things with no one to talk to -- I hope some of them can find their way to a book like this and realize things can change. Well, I mentioned before how I hated this book. I felt like the end was rushed and overly sappily supposed-to-be-bittersweet, which, for me, completely negated any 'redemption' the story could have had. I mean, really, was that last death completely necessary? And then everything was hunky-dory with apparently no residual bad habits to overcome? How is that realistic? I liked The Mark of the Lion series (though I'm wondering if I reread it if I would), but when I look back over all the Francine Rivers books I've read, I won't read her again. This last book was the clencher. Her stuff is too dramatic, emotional, and consuming, because it IS realistic, and I really don't think I need to dwell on such things, especially at this time in my life. I figure there's enough drama in what goes on around me that I don't need to supplement it when I could read something edifying. And, OK, while her books are well-written, especially from the point that they consume you and the characters are engaging, I don't think they're brilliantly written. "It is a brilliantly told harsh story." I haven't read this one, and I'm not going to run out and get it. But I understand what you mean about it not being the right time for it... I find I can read and benefit from difficult books, but if they whack nerves already sensitive from something I'm going through they just drag me down. Susanne - Yes, I agree. I do think people will be able to connect with the story, for certain. Therefore I can't NOT recommend it. I think it is reality for a lot of people - perhaps even ALL people in some form or fashion. Serena - I thought of your prior statements often when reading. Janet - Yes, that about sums it up for me. "Bad timing." Interesting to read your perspective on the books, but I can see how the timing was poor--expecting your first daughter! :P I'll stick with my original review in that it was a really sad story about how we can get stuck repeating family cycles until we allow Christ to truly work change in our lives. As a mother of daughters, and as a daughter, I found it very thought-provoking and it made me examine myself. It wasn't the fun and easy read that some of her books are, but I think it was definitely worth reading. I have to say, your experience of poor timing happened to me with Liz Curtis Higgs' Fair is the Rose. It's an adaptation of Rachel and Leah set in victorian England and about midway through the book I got a premonition that the "Leah" gets sent away and her younger sister Rose gets to keep her 2 year old son. Cory was about 3 months old at the time and I just died. I couldn't even finish it. I called a friend who I knew had read it and she told me that it was a) the second book in a trilogy and b) yes, eventually she would get to come back and have her son, but I still couldn't handle it! Well, you already know how I feel about this one. I don't think it's her best work, or even representative of what she can do. These two are indeed hard to read. My book club read both last year. Great discussions for both. Overall consensus -- loved the books, disliked somecharacters. Interesting that characters we disliked in book 1 we liked in book 2 and vice versa! I have yet to read this series, but I do have Her Mother's Hope on my Nook to read very soon. Thanks for the great and honest review! I loved both of these books but they are not my favorite by Francine Rivers, who is my favorite Christian author. The "Marta's Legacy" series is dramatic and, at times, very dark but it is wonderfully and dramatically told. It kept me interested and kept me turning the pages. It made me very uncomfortable at times, but mostly because I could see so much real-life truth in the relationships. It is definitely not a "light" read, but I don't think any of Francine's books are. I kind of felt that she was rehashing some of the same issues that she wrote about in "Leota's Garden". The "Mark of the Lion" series is still my favorite of all her books. Hmmm... I can't decide if I want to read this book. I read the first and both liked and disliked it. It sounds like the second book might be even more intense. Also, it's been over a year since I read the first book and I wonder if I would need to reread it before starting the second book. Honestly, I don't want to reread the first book as I had a hard time getting through it. I like Rivers, especially Redeeming Love. But maybe I'll skip this one. So would you recommend me even reading Her Mother's Hope, since a friend (ahem, named Carrie) left me a copy last year? Or if I shouldn't even start?? I sort of don't mind depressing, as long as there is something redeeming as others have mentioned. Is there more to come in the series, or is this it? I read these books because of learning of them on this blog. I could not finish Daughters Dream and returned it to the library. Then had to check your blog- well your review really lined up with my thoughts. I was so tired of an angry mother and a daughter who did not feel loved. I had finished Mother's Hope with hope that things would be patched up, healing could take place. That was not to be! I also admit that timing is tough here as baby is coming any day, and I did not want to read anymore of children being abused or feeling unloved.